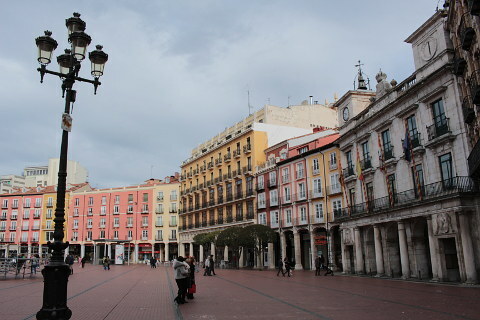 Burgos was once the capital of the Castile and Leon region of Spain and is steeped in history. It grew wealthy in the 15th and 16th centuries as a result of the wool trade and spent a lot of money on fine art and architecture. 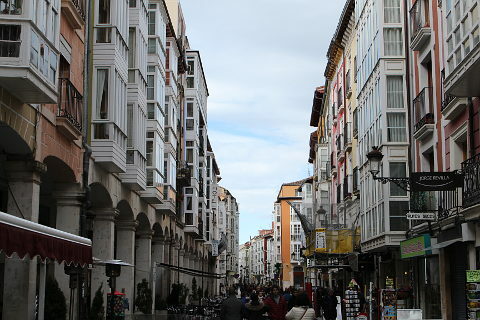 Burgos is in the province of Burgos in the Castile and Leon region of Spain. 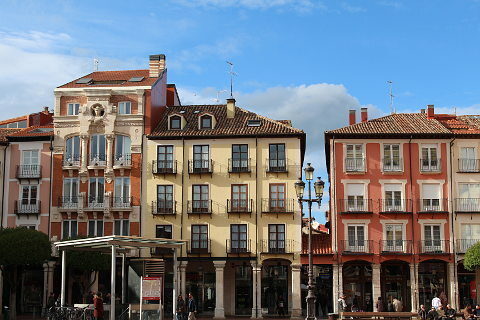 Burgos is on the main pilgrim route to Santiago de Compostela. Burgos cathedral is Spain's third largest cathedral and is Burgos' main attraction. Its fortified gate, the Arco de Santa Maria, and Burgos' two monasteries are the main sights. 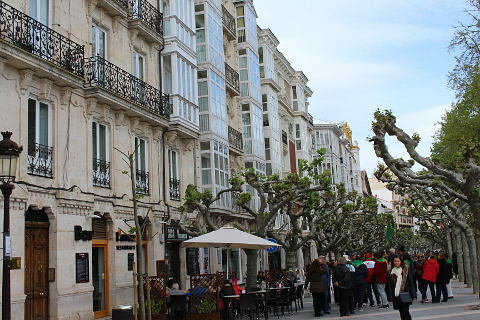 Approaching the old town from the Santa Maria bridge and you pass through the wonderful Arco de Santa Maria. 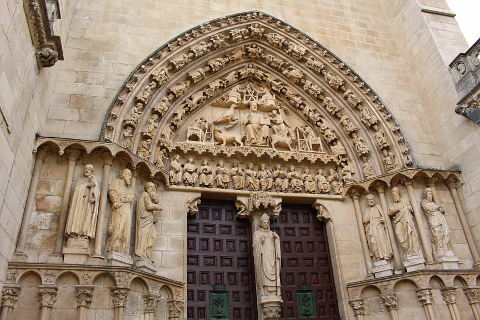 This heavily castellated 14th century gateway is decorated with statues of various important Burgos residents. Before entering the old town through the arch there is a lovely riverside promenade, the Paseo del Espolon that is always thronging with people and is a favourite of Burgos residents. Once through the arch you enter the Plaza Rey San Fernando and see the imposing Burgos cathedral. 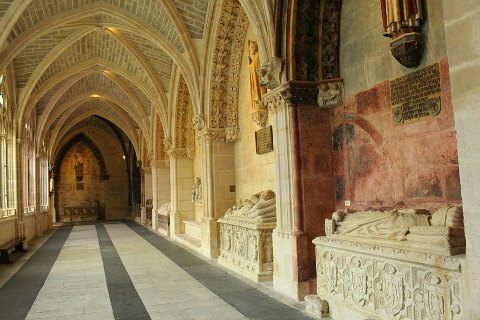 A visit to the cathedral is not cheap but it is the main reason to visit Burgos and there is a lot to see inside. We hesitated but definitely recommend a visit. 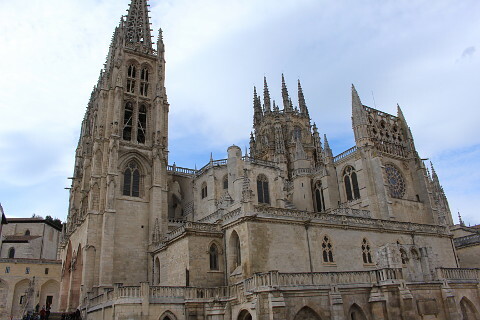 Burgos cathedral is built in the gothic style and has lots of outstanding features. 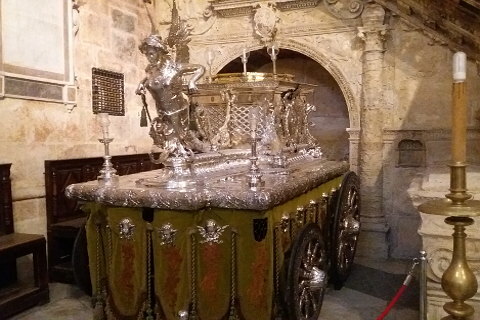 One of its chapels is the setting for the tomb of El Cid who was born just to the north of Burgos. Its colossal size means that it can be seen from all over Burgos. Indeed it is the third largest cathedral in Spain after Seville and Toledo. The cathedral is a UNESCO World Heritage Site. Inside the cathedral there are fabulous painted ceilings, ornate alter pieces, carved altar seats, a beautiful dome with mudejar style details, portrait rooms, rooms with exquisite religious art and much more. Look out particularly for the octaganol Chapel of the Condestable which is decorated in flamboyant Gothic style and is remarkable. 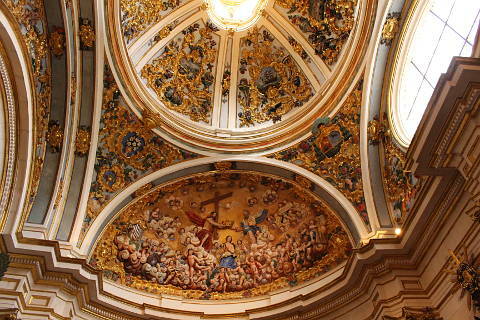 Close to the cathedral is the 15th century San Nicolas church which has a very fine altarpiece. 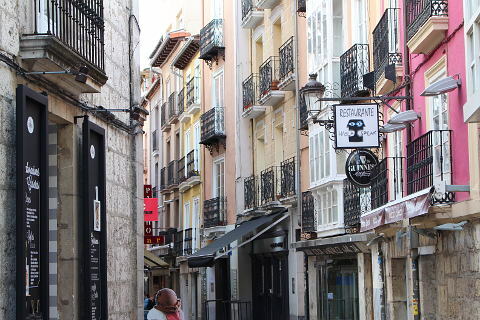 The old centre of Burgos is very attractive with narrow streets with painted buildings and open squares again with colourful buildings. Burgos also has a reputation for its food and we certainly had our best tapas and meal in Burgos of our recent drive through Spain. Ask at the tourist office for their tapas guide. On the outskirts of Bugos is the beautiful Monasterio de la Huelgas, a mix of Gothic, Mudejar, Romanesque and Renaissance architecture. This monastery was one of the most powerful in Spain in its day. It contains the tombs of 16 kings, queens and nobles, and its museum contains the magnificent jewellery etc that were found in the tombs. Don't miss the cloisters, Las Claustrillas, which has some lovely Mudejar decoration. Another monastery, the Catuja de Miraflores, is also worth a visit. 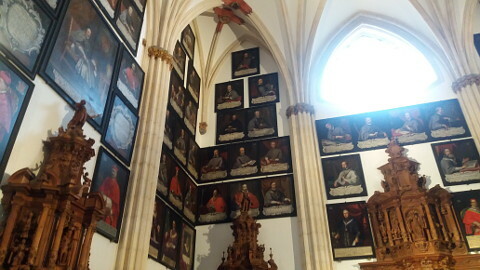 This sits to the east of Burgos and contains three masterpieces by Gil de Siloé. His alterpiece is gilded using some of the first gold to be brought back from the New World. The ruins of Burgos castle stand on a hill overlooking the city and offering great views. This area is now the Parque del Castillo and also has some gardens and childrens play area. The Museo de Burgos, the museum of Burgos contains archealogical finds from Clunia. It is housed in the beautiful Casa de Miranda, a 16th century palace. 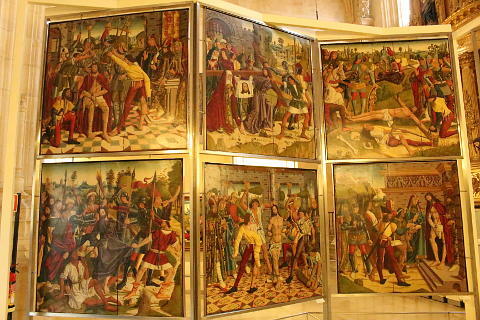 The Reredos museum is in the gothic church of San Esteban which has an early gothic cloister. Fairly newly opened in Burgos is the Museum of Human Evolution and this is now the 10th most popular museum in Spain. The museum is housed in a buiding designed by award winning architect Juan Navarro Baldeweg and houses exhibits related to fossils found at the UNESCO World Heritage site of the Sierra de Atapuerca, 16km to the east of Burgos. Near to Burgos is the Monastery of San Pedro de Cardena where El Cid took his family when he was exiled by Alfonso VI. If you get the chance visit Penaranda de Duero, a medieval village with a very pretty historic centre. The UNESCO World Heritage site of the Sierra de Atapuerca is just 16km away.